Sanchez-arcilla, A.; Caceres, I.; Thorne, P.D. ; Eiff, O.; Lacaze, L.; Hurther, D.; Barraud, P.A. ; Musumerci, R.; Vousdoukas, M.; Sancho, F.
Coastal Engineering still presents significant levels of uncertainty, much larger for sediment transport and morphodynamics than for the driving hydrodynamics. Because of that there is still a need for experimental research that addresses the water and sediment fluxes occurring at multiple scales in the near shore and for some of which there are still not universally accepted equations or closure sub-models. Large scale bed tests offer the possibility to obtain undistorted results under controlled conditions that may look at sediment transport and associated bed evolution under a variety of wave and mean water level conditions. The present limitations in conventional observation equipment preclude a clear advancement in knowledge or model calibration. However the new developments in opto-acoustic equipment should allow such an advancement to take place provided the new experimental equipment becomes more robust in parallel with a protocol for deployment and data processing. This paper will present the experimental approach to erosive and accretive beach dynamics, with emphasis on the accretive experiments. These accretive tests still present further uncertainties and sometimes cannot be explained with the present state of the art. Following this there is a presentation of the novel development of an acoustic bed form and suspended sediment imager, able to monitor bed forms near bed sediment transport and their corresponding dynamics. The next section deals with an acoustic high resolution concentration and velocity profiler that is able to infer even the elusive bed level, together with the near bed concentrated sediment transport and the details of fluxes on the stoss and lee sides of moving bed forms. This is followed by a discussion on the merits of novel optic techniques, using structured and unstructured light sources. There is also some remarks on new approaches. Illustrated by the use of ferro-fluids to obtain directly the shear stresses acting on a wall even under the presence of “some” sediment. 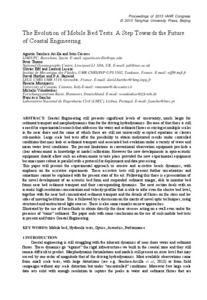 The paper ends with some conclusions on the use of such mobile bed tests in present and future Coastal Engineering. Sanchez-arcilla, A. [et al.]. The evolution of mobile bed tests: a step towards the future of coastal engineering. A: International Association for Hydraulic Research Congress. "Proceedings of the 35th IAHR World Congress". Chengdu: 2013, p. 1-12.